an abnormally shaped erythrocyte, such as a burr cell, sickle cell, target cell, acanthocyte, elliptocyte, schistocyte, spherocyte, or stomatocyte. A red blood cell of irregular shape. /poi·ki·lo·cyte/ (-sīt) an abnormally shaped erythrocyte, such as a burr cell, sickle cell, target cell, acanthocyte, elliptocyte, schistocyte, spherocyte, or stomatocyte. Mean values ([+ or -] SD) for RBC, WBC, HGB, Ht, PLT, MCH, MCV, retikulocytes, poikilocytes in 8-week old rats, swimming in water at 4[degrees]C, 25[degrees]C, and in the control group group I Morphological parameters control RBC [106/[mm. 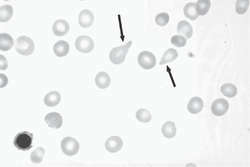 Peripheral blood smear showed predominantly normocytic, normochromic, red cells, no nucleated RBCs and small numbers of teardrop poikilocytes. Complete hemogram shows Normocytic normochromic anemia with sickle cells, poikilocytes, target cells, fragmented RBC and no haemoparasites. However, no leukoerythroblastic picture or tear-drop poikilocytes were seen. It is much easier to classify 100 individual cells and identify a few red cell poikilocytes than to make an educated decision about whether relevant findings are present.